Ryan Macklin and Jonathan Walton are organizing a short anthology on tabletop roleplaying (broadly defined) to be published in coincidence with (i.e. at the same time as) GoPlayNW 2011, which will presumably occur in late June or sometime thereabouts. If you’re interested in being a contributor to this project, read all the way to the end. First, we’ll tell you about the project overall, then we’ll tell you what we want from you at this first stage. 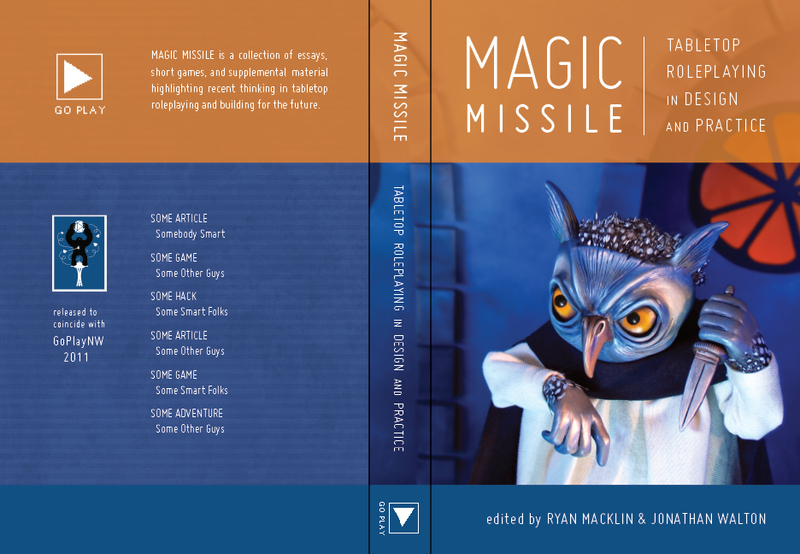 The anthology is tentatively named “Magic Missile” (the working title for the anthology Jonathan published in 2006, Push: New Thinking About Roleplaying [PDF]). While this project certainly builds on the ashes of the “Push 2″ project, it’s a new, separate thing and very specifically a one-shot book, rather than a journal or series. “Magic Missile” will be specifically aimed at what Ryan called the wider “GoPlay culture”: basically anyone who has participated in any of the small local conventions and meetups that have sprang up in response to the most recent wave of small-press games. These are the folks most likely to come to GoPlayNW. The content we’re looking for will reflect the diversity of games they are interested in, i.e. everything from Apocalypse World to Trail of Cthulhu to Smallville to old school dungeon crawls. “Magic Missile” will consist of short stand-alone games, supplemental material for (or hacks of) published games, thorough reviews of significant games and game-related publications, and more academic-style or analytic articles addressing various aspects of design and play. All contents will remain the intellectual property of their respective creators and we will deliver the final version of creators’ submissions back to them, so that they can do what they like with their material. The staff of “Magic Missile” (Jonathan, Ryan, and others we may involve) will simply offer assistance with editing, organizing playtesting, and layout — enough to get the material into a “final” form — plus two contributor copies (see below) in exchange for the rights to release the material 1) in a limited print run and 2) as part of the anthology PDF, in perpetuity. 1. Short Standalone Games: We are specifically looking for games that are unlikely to be polished and released by their designers without strong support and editorial assistance. If you are planning on publishing your game yourself, we would rather you do that. But there are plenty of solid drafts out there that need help moving forward, often drafts produced in contests like Game Chef, and those are more what we want. In general, we DO NOT want folks to submit their games in this category. WE WILL FIND YOU. But if you think your game might be overlooked, since it was written independently or as part of some obscure contest that we’ve never heard of, you are welcome to bring it to our attention. 2. Supplemental Material and Hacks: We would like to feature some supplemental game material — specifically, really good and innovative adventure writing, but other things too — preferably for games that are widely known and played at local conventions and meetups. Both designers and publishers are welcome to contact us about potentially submitting such materials, though work coordinated by publishers will also go through our own editorial process. For supplemental material or hacks, we definitely prefer material that does not require previous knowledge or familiarity with other publications or media, just a familiarity with the rules of the game. 3. Reviews of Games and Related Publications: We would like to read some thorough and insightful reviews of games that you have played at least ten times, with multiple different groups of people. Most often, we encounter reviews done by folks who’ve played a game once or twice but do not yet have a deeper appreciation of the game. This is unfortunate and we’d like to do something about it, by featuring reviews that really get at the meat of a game and maybe even offer comparisons with related games. We would also like to include reviews of recent or respected publications on roleplaying — “Things We Think About Games” comes to mind, or “Rules of Play,” or “Play Unsafe” — that openly wrestle with the ideas these books put forward, not merely describe their contents. 4. Analytic Articles: Finally, we’d like some articles that analyze specific aspects of tabletop roleplaying. We are not interested in publishing broad theoretical frameworks, but are much more interested in building a deep understanding of some facet of design or play. For example, Jonathan was working on an article on endgame mechanics for “Push 2,” describing both their recent historical development (starting around 2001) and the different ways designers have implemented them so far. Analytic articles should assume an interested, educated, but potentially unfamiliar audience and be careful to define all terms and avoid jargon as much as possible. We would also prefer empirical evidence or textual analysis (of rule books or play transcripts or forum discussions) to anecdotes and speculation, though we realize there are limitations. Once you give us something to work with, the editorial and playtest process starts. Note that NOT ALL SUBMISSIONS WILL BE ACCEPTED IN THE END, even if we like your original proposal. If we cannot come to an agreement about editorial or playtesting issues or if you refuse to make changes that we think are necessary or the draft you submit doesn’t really fulfill the promise of your proposal, we will simply release everything back to you — including any editing or collaboration that has been accomplished so far. The ultimate decision to publish the final work in “Magic Missile” belongs to the author, though if we work extensive with you and then you decide, at the last minute, to take your work and leave us hanging… we will not be super happy. But we expect to keep the lanes of communication open and don’t think there will be too many serious issues. Ultimately we just want to make a cool book and are happy to take or leave any specific piece to make that happen. Right now, we’re planning on providing two physical copies of “Magic Missile” to each contributor, as well as the electronic version. Rights of work are retained by the contributor, as we stated above. Shipping of comp copies will be provided by the contributor, for those who won’t be going to Go Play NW (or see Ryan at another summer con). Our plan, at this point, is to print a fixed number of books (the amount to be determined) that we sell through pre-orders, directly to GoPlayNW attendees on site, and (afterwards) on the internet until we have no copies left. At that point, the PDF version of the book will be made freely available to all, though it will be made available earlier to those pre-ordering. In effect, the PDF is “ransomed” by selling through our initial print run. We want this pitch by January 1st, 2011. For emphasis: January 1st, 2011. If we’re hard-pressed for pitches afterward, we may extend the deadline, but assume we won’t. Expect us to talk a little bit about your idea. If you aren’t sure what the title is or are fuzzy on the word count, but you feel like you’ve nailed down the idea itself, pitch it to us. Start the conversation. You can pitch more than one idea, but in different emails, please. If we like multiple ideas, we’ll talk with you regarding which you’re most interested in and if you have time to make more than one. In all likelihood, we’ll not take more than two ideas from any one person. Note that IF YOU CAN’T FOLLOW THE BASIC INSTRUCTIONS FOR SUBMITTING A PITCH, it may raise doubts about your ability to deliver a draft or revisions. Put your best foot forward, please. We’re going to want the actual submissions by March 1st, 2011. That means you have two months after we’ve closed proposals to write a complete article (and more than three from today). We’ll be going back and forth with the editorial process, the goal being text complete by May 1st, 2011 so the book can go into final layout and printing in time for Go Play NW. Thank you for taking the time to read this, and we look forward to your contributions and the awesome book this promises to be! So, after futzing around a bit after GenCon, it’s time for me to really hit Push 2 hard and get it ready for commentary. I have all of the current drafts printed out and redlined (and have for a while), but I need to get those comments back to the original authors so they can make edits before I do the final pass. Then it’s off to the commentators and we’re closer to gametime. In preparation for focusing my attention back on Push and away from my personal design projects, I also contacted Shannon Appelcline about writing a column for RPGnet, following on the Fine Art of Roleplaying column I wrote in early 2004. He seemed to think it could be a possibility, so I’m beginning to outline the first few installments. Many things have changed since then. I finished college and a Fulbright Fellowship in China. Now I work for an independent foreign policy think-tank in Boston, writing papers for the government on various international issues. 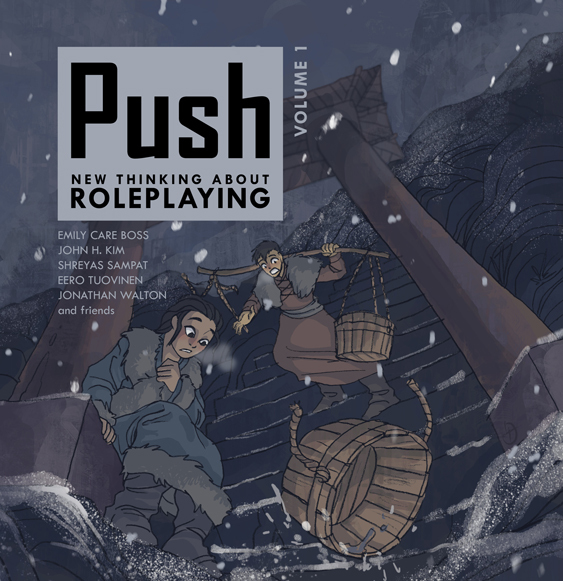 I also edit and publish Push, a journal on new developments in roleplaying, which is in the process of putting together its second issue, which will hopefully be out by December. For the past several years, after leaving The Forge and striking out in a different direction, I’ve been basically doing my own game design and thinking off by myself, mostly on my personal blog. Lately, though, I feel more attracted to the idea of interacting more with the public, online face of roleplaying, which RPGnet represents a fair portion of. I guess I feel like there are many interesting developments happening on the fringes of roleplaying that many people never get to see because of all the cliquishness, internet posturing, and so on. The Forge, even back when I was reading it regularly, is not the most accessible place for newcomers and can tend to have a limited perspective on the hobby as a whole. And many roleplayers are mostly concerned about what’s happening within their favorite game lines and may not be aware of general trends in the hobby as a whole. So my proposal for a new column is inspired by a common topic in foreign policy study: I want to look at the contemporary “Issues and Trends” in roleplaying design and play, picking one to talk about every month and discussing it in detail by talking about how recent games or companies have chosen handle a given subject and where things may be headed in the future. Topics could include things like GM-less play, the evolution of alignment systems, trust mechanics, open game systems, diceless play, publication formats, print-on-demand, combat systems, the planning of supplements for a core game line, resolution systems, and other issues and trends that seem to be going on in roleplaying. I want to take a big picture look at the industry without focusing too much on sales numbers and distrubution, focusing instead on what the products are actually like and comparing developments in tabletop scenes as diverse as Exalted, d20, and the newest indie games, which I don’t think happens often enough. Despite the barriers that separate various roleplaying sub-communities, there are interesting synergies and shared themes that enable us to learn from what other people are doing in their games. Right now, I’m thinking that the first column may be about the tradition of having “things your character cares about” give you advantages in conflicts, but I’m not sure I really know where that begins, not having played a lot of old school RPGs like Cyberpunk and AD&D. I know a bunch of people point to things like The Riddle of Steel‘s “Spiritual Attributes,” but I guess I doubt that TROS was the first game to fiddle with stuff like that. Suggestions?